To improve comprehension, let readers talk about books for extended periods of time. When they do, students are more energetic, engaged, and empowered. Not surprisingly, they learn much more than when they work alone. I call these conversations “structured talk” because I teach students how to follow several formats. To be successful, the students know and follow a framework (with flexibility) so they feel as comfortable as possible about what they are to do. I can talk about books effectively with others in my discussion group. 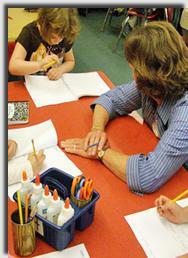 I can listen effectively to others in reading circles. I can anticipate problems with discussion groups. I can seek solutions when discussing with my peers. I can use “argue-safely” language. I can work in a variety of discussion group formats. Some teachers fear letting students talk: how will I know what the students are talking about? How can I be sure the talk is on task? If I can't be everywhere, will the students participate appropriately? Students are nervous, too. They don't know what to say. They don't want others to think they’re dumb. Some never have seen anyone talk about books, so they don't know how. I admit, teaching students to talk to one another about texts is not easy, but they will make so much progress if they do. (1) Teach students how to talk and listen in a group. (2) Give learners choices whenever possible. (3) Teach and post the steps for each discussion-group format so that students know what to do. (4) Make a plan with your students so they have input into what to do when things go wrong. (5) Teach students how to disagree safely. (6) Make learning targets, assignments, and deadlines clear. Finally, expect and ignore some off-task talk. I would go so far as to say it is necessary for productive conversation. Watch a group of adults talk. At first, the conversation is small talk, then it becomes centered, and then it blurs off task. The talk comes back to focus several times. Similarly, expect students to meet your goals, but allow some latitude. 1. Teach students how to talk and listen in a group. Research and reach consensus regarding definitions of talking and listening. For example, take your class to a place to watch people talk. One perfect place is the cafeteria. Hand each student a clipboard, paper and pencil and head out to research. When you get back to your classroom, create charts outlining talking tips students discover work. For more lesson ideas, read Knee to Knee, Eye to Eye, by Ardith Davis Cole. Sympathize with students about how hard it must be to get up every day knowing that their rewards might be years away. Brainstorm ways to make getting the work done more palatable. Seek students’ opinions about when work should be due. Give students choices about what to read. Vary the discussion formats to meet all learning styles. 3. Post the steps for each format so that students know what to do. I devoted a page to explaining the steps for each format. Click here to read the bottom of this page, where you will find a quick link to each discussion-group format. What do the members of the group do if a group member comes to class without her book? What should we do if someone has been absent? What about the classmate who says they've been trying but the group is going too fast and they can't keep up? How do we help students who never speak? Look at one another when you talk. If someone says something and you don’t understand it, you can ask him to repeat what he said.If you ask a question and you don’t get a complete answer you understand, you can ask someone to clarify again… and again. If you are listening, it helps the speaker if you turn your body toward her. You would think that practicing tests over and over again would improve comprehension, but... students don't learn from drills. Engage learners by letting them discuss their observations and questions in small groups. They care about finding the answers to their own questions. They ask questions about misconceptions I can't imagine they don't understand and yet they need to know before they can move into inferential thinking. Don't prepare questions about what they read. Instead, ask them what they want to know, what they don't understand, their reactions to the books, and how the books are affecting them. Ask them how they reached the conclusions they did. In other words, ask them about their process of reading, which they will use every day, not whether they understood this one text, which they will never need. This question-seeking, evidence-finding activity is a very sophisticated way of teaching students to answer test questions and prepare to solve life's dilemmas. Put steps in place slowly and methodically for the formats that work for you and your students. One page for each format follows so you can find more specific definitions and directions on LikeToRead. So many discussion groups. Read to find out the difference. Comprehension floats on a sea of talk.